This website is about the USS Conserver (ARS-39), its voyages, and it’s crew. Content is provided by shipmates who have a desire to share their stories and experiences. If you desire to be involved with this website, we ask that you register as a contributor and post to the blog. 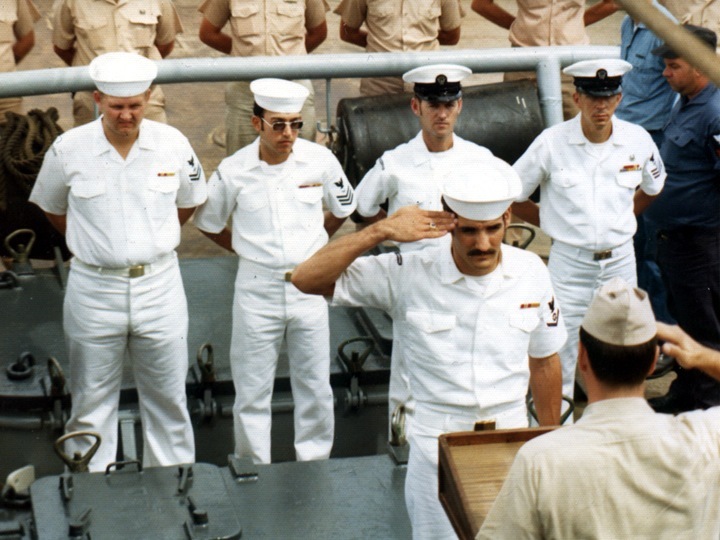 EN3 Romondo Davis receiving letter of commendation in June, 1974. Also pictured are RM2 Barman, YN1 Castro, PN1 Jones and HM1 (DV) Cheeley. This site is created and maintained by Romondo M. Davis, who reported onboard Conserver at Pearl Harbor in January, 1972 fresh out of Engineman A-school at Great Lakes. He departed an EN2 almost three-and-a-half years later in June of 1975. He created his first Conserver website around the year 2000 and removed from the Internet several years later due to lack of time and new content. He is an internet marketing and digital media development consultant by trade. On Conserver he worked in B1 and served as Engineering Log Room Yeoman and Fuel and Water King. His grandfather was a YNC in WWI. His dad was a YN3, serving as Log Room Yeoman on the USS Currituck (AV-7) in the Pacific during WWII. His son was a CTI2 (Arabic) serving from 2004 to 2010.